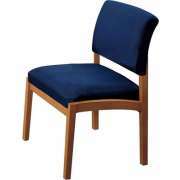 Reception Chairs: Shop From Our Extensive Selection! 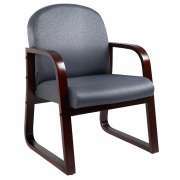 Demonstrate your professional style with a few choice club chairs from Hertz Furniture. 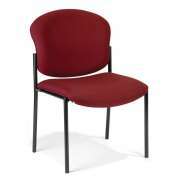 Attractive reception chairs can give a personal office or waiting area a whole new look and feel. With a wide selection of styles and upholstery colors, a number of great choices can be found for any space. 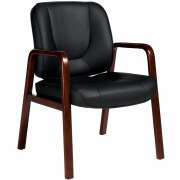 Hertz Furniture&apos;s office lounge chair collection includes models from dependable manufacturers including High Point and Office Star. 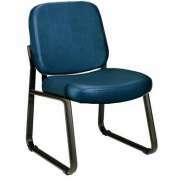 What is a good layout for lobby chairs? This broad selection is designed to fit any space, style or budget. With sleek options from Hertz Furniture, you can find a layout that looks great. 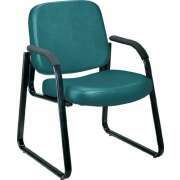 Why are office reception chairs so important? When clients, patients and colleagues come early to a meeting, you don&apos;t want to leave them standing around in the lobby. Waiting around with no place to sit can be quite uncomfortable and annoying, especially for someone who is nervous about a procedure or meeting. When your reception area is furnished with supportive club chairs, anyone can stay relaxed, no matter what awaits them behind the doors to the office. With great seating, the time will pass quickly, and people might just not mind relaxing for a few extra minutes. The reception area isn&apos;t the only place where a few cozy club chairs can go. 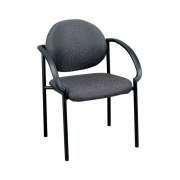 Large executive suites and employee lounges can also benefit from the addition of some comfortable seating. When hosting an informal meeting in an executive office, it is nice to have a more relaxed place to sit, rather than having to stay behind a desk. 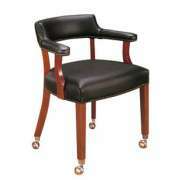 Clients and colleagues will feel more at ease when seated in lobby chairs. 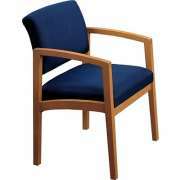 The right reception chair should fit in with the decor of the waiting area as well as the overall style of a company. Many of our models have wood accents which can be matched to reception desks, bookcases and other furniture for a coordinated space. Whether you are looking for classic elegance or contemporary appeal, you want to make sure that you are also providing a cozy place to sit. 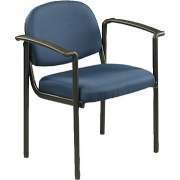 What kind of lobby chairs are the most comfortable? 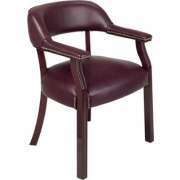 Although style is certainly important in any professional setting, proper support is ultimately what makes a great chair. 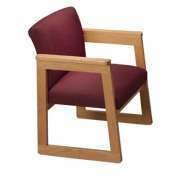 Lobby chairs are designed to promote relaxation. They come with varying degrees of padding. When you are deciding between a number of models, one factor to consider is the the thickness of the seat and back cushions. 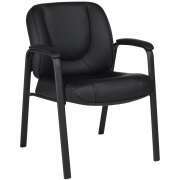 Many office lounge chairs also feature padded upholstered armrests. 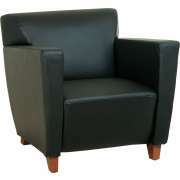 This gives the club chair the appearance of a small couch. 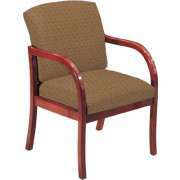 If you prefer a more formal look, you might want to consider a model with wooden armrests. This is also a great option if you prefer to have more natural tones in your workspace, or you want the coordination of chairs and other furniture to be more noticeable. 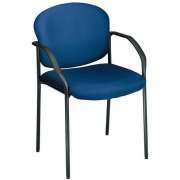 How do you choose office reception chairs? Choosing the right chair style is entirely a matter of taste. 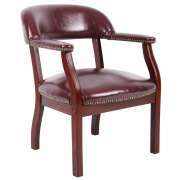 Luxurious leather club chairs exude professionalism and confidence. If you like the classic elegance of leather, but want a contemporary feel, we have a few models that synthesize these two elements beautifully. Leather is soft and flexible and will maintain an attractive appearance that never goes out of style through many years of appointments and meetings. For a more traditional office setting that projects a mature and experienced approach to business, consider some conservative fabric club chairs. Button tufting and nail head trim provide attractive accents that are reminiscent of times gone by. The vinyl upholstery is built to support the modern consumer. It comes in a selection of rich, deep hues and is resistant to tears and stains. 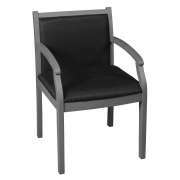 How can I coordinate club chairs with my other reception furniture? High-class seating will stand out and make an impression when it is coordinated with the decor of the room you are furnishing. Many of our models are available in a wide selection of frame and upholstery colors so you can coordinate them with paint colors, or bring some new hues into your space. 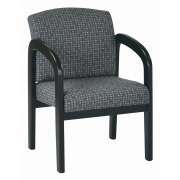 Fabrics are also available in various grades so the same lobby chair can fit a variety of budgets. 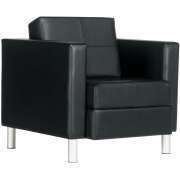 At Hertz Furniture, we know how to synthesize style and comfort to bring you the optimal selection of club chairs. Our seating is designed to support your clients and colleagues while making your reception area look great. If you need help choosing the right club chair, or aren&apos;t quite sure which is the best upholstery choice, contact the design experts on the Hertz Project Solutions team for a free consultation.